This was one of the first pieces of Yeo research I undertook many years ago and the two monumental inscriptions shown below are a prominent feature of the Pilton churchyard. Whilst there are many Yeo M.I. 's in the area, most of these link to the Swimbridge Yeos. Richard moved to Pilton from Holsworthy, probably because of his marriage to Petronel Tossel. The Tossell family were already living in Pilton, although they also had connections with Holsworthy. Richard & Petronella's monumental Inscription is mounted on the right hand wall of Pilton Church entrance. Alongside it is a memorial to John Tossell, Petronella's nephew, son of her brother Nichola s, and the last John Tossell of Pilton. 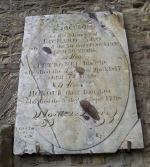 Richard Yeo was born 1742 in Holsworthy, Devon, son of Richard Yeo and Honour Bynes and he married Petronella Tossell on the 2 January 1765 in Pilton. Petronell was baptized in Pilton Church on the 30 th March, 1745, daughter of Thomas Tossell and Mary ne Cooper. Once again the family gossip appears to have been correct. The Yeos were wealthy. With the discovery of Richard's will we have managed to establish that he was the son of Richard and Honour Yeo. Baptised in Holworthy on the 6th October, 1742. (Holsworthy is roughly twenty miles from Barnstaple) . As we already know he married Petronel Tossell and lived in Pilton, where he died on the 6th November, 1797. He was a tanner working with leather goods. Although when he died he appears also to have been an innkeeper. He must have been ill at the time of making his will because he mentions "being weak in body but of sound mind and understanding". His elder son, Richard, was 18 years old at the time of his father's death. Thomas, our Great Great Grandfather, was 15. They were both left £100 each. £50 to be received at the age of 21 years and the balance to be received when they were 24 yrs old. The eldest daughter, Mary, must have been her father's favourite. She was left an annuity of two hundred shillings weekly for life and her two children, Thomas and Ann Copley, each received £5 when they reached the age of 21. Honour, the second daughter, received an annuity of two shillings weekly for life. As she married a militia man perhaps her father did not approve of the match. Nevertheless, the will goes on to stipulate "the said weekly payments to my said daughters Mary and Honour to give for their own separate use and their husbands shall not interfer or borrow anything." I like that bit! The youngest daughter, Ann, was 11 when her father died. She received £40 when she was 22. Apart from a bequest of £5 to both his mother and his father and £5 to brother Benjamin, Richard left the remainder of his estate to his dear wife, Petronel, unless she re-married - in which case she was to receive £100, the best bed and the choice of any of the furniture! We know, of course, that Petronel did not re-marry but left everything to Ann. Another interesting point about this will is the fact that a John Baker, a malster, is mentioned. (He sold some property to Richard) . Ann eventually married a Francis Baker six months after her mother's death. As we do not know who fathered Ann's two illegitimate children, Julia Ann and William, did Francis decide to get the property back into his own family by making an honest woman of the now wealthy Ann? This is where the money went out of the Yeo family. In those days the husband took the lot - as Richard foresaw - but I do not expect he thought his little daughter would grow up to be such a flighty piece! iMary Yeo, born 14 December 1766 in Pilton, Barnstaple, Devon. Honour Yeo, born 22 December 1776 in Pilton, Barnstaple, Devon. Richard Yeo, born 29 March 1778 in Pilton, Barnstaple, Devon. Ann Yeo, born 5 January 1780 in Barnstaple. Thomas Yeo, born 2 June 1782 in Barnstaple. Ann Yeo, born 27 August 1786. Thomas Yeo was born 2 June 1782 in Barnstaple. Thomas does not appear to have worked until he was 18 when he was apprenticed at Launceston. Although he was an officer he does not appear to have been promoted to Captain. No doubt he was transferred to the Preventive Boat Service to deal with the smugglers that were prevalent around the coast in those days.) He was apprenticed to the sea in August, 1800, at the age of 18, at St Thomas by Launceston, Cornwall. (What he was doing in Cornwall we do not know.) He seems to have been a man of many parts. He remained at sea (in what capacity we do not know at the moment) for 18 years and 9 months. He was then nominated to the Preventive Boat Service in May, 1818, as a commissioned boatman - Age 35 years at a salary of £5 per annum. He also got 3 shillings for other allowances appointed by the Treasury. Thomas married (1) Mary and in 1818/1819 he appears to have been living in Fremington, where his daughter MaryAnn was baptized. I have never found a marriage for these two and would think that it is possible they were having an affair and this is why his mother left him so little in her will. Mary Ann Yeo was baptized on the 30 th January 1819 at Fremington and in that year there is a removal order issued by Fremington Parish for Thomas and Mary and child to be returned to Pilton. He married (2) Elizabeth Shapland 22 April 1822 in Barnstaple at the age of 40 and was supposedly a bachelor and described himself as a Millwright so he can not have been in the Preventive Service for long. So where he obtained his carpentry experience (as stated at John's birth) we do not know. Thomas and Elizabeth ne Shapland had three children, Mary (1822), John (1924) and Jane (1825) who died in infancy and sadly their mother Elizabeth died shortly after Jane's birth and was buried on the 9th October, 1825 in Pilton church yard. Thomas was also buried there on the 7th September, 1839. However by 1851 MaryAnn and her sister, Mary were both servants working in Upcott House, Pilton. MaryAnn remained there for many years and her address and photograph were found amongst John's possessions when he died at sea. MaryAnn Yeo died on the 9 th July 1897 and was then living at 31, Fore Street, Barnstaple. Probate was granted to her niece Alice Louisa Hanewinkel (wife of Augusta Frederick Hanewinkel) Effects £345. 4s. 6d. Mary moved to London and became housekeeper to Sir William Drake who lived in South Kensington so it seems there were still past family influences that enabled her to do well.. She died in 1895 and in her will bequeathed all her personal estate to her five nieces, the children of her late brother , John Yeo. She names them as Alice Louisa, wife of Augustus Hanewinkel, residing at Granby Street, Liverpool, Margaret Rowson, widow residing at 83m Kinsley Road, Liverpool, Sarah Elizabeth Yeo, spinster residing at 83, Kingsley Road, Liverpool and Elizabeth Caroline Yeo, spinster and Emily Miriam Yeo, spinster who also both are now residing at 83, Kingsley Road, Liverpool. "Captain John Yeo commanding Whinfell, Monday, 5 th January, 1863, at 19.30 hrs -At 7.30 p.m. Captain Yeo left the deck and coming into the cabin appeared to suffer greatly from a severe fit of coughing, and also apparently from spasms. He ordered the steward to bring him a little AFTER and shortly after that took 25 drops of laudanum. Neither of these seemed to give him any relief from pain, although the cough had now ceased and going at once to bed he drank a little brandy and water, which, however, he immediately vomited and desired to have 25 drops more laudanum. The steward returning with it, and not having a light, found Captain Yeo (as he supposed) asleep, but on obtaining a lamp it appeared that in the interval of his absence while procuring the last dose of medicine, Captain Yeo had died. Death must have taken place as near as possible at 8.00 p.m."
Alice Louisa 18 Yeo, born 20 September 1848. She married A. Hannewinkle. Margaret Rowson Yeo, born 3 January 1851. She married Mr Roberts. Sarah Elizabeth Yeo, born 8 August 1854 in Liverpool; died 1932. Emily Miriam Yeo, born 1861 in Wavertree, Lancs. She married Jim Coop. Elizabeth Caroline Yeo, born 1867 in Liverpool. Mary Elizabeth Yeo, born 6 October 1846. By 1881, Sarah had remarried John Armstrong and they were then living at 50, Botanic Road, West Derby, Lancs. With them were children Sarah aged 26 and Emily age 20. Sarah Elizabeth Yeo was born in Liverpool on the 8th August, 1854. The middle daughter of John Yeo's five girls. She married Matthew Leavens Fawcitt at st Brides Church, Liverpool, on the 18th July, 1886, when she was thirty-two years old. Grandmother had been engaged at one time to a Captain. When he was away at sea another mariner called to see her and told her tales of her fiance's misdeeds. Sarah Elizabeth broke off the engagement, where-upon the bearer of ill tidings promptly proposed to her himself!. Grandmother turned him down and subsequently discovered that all his tales were untrue. She told me she was "too proud" to go back to the man she had wronged and therefore remained single living at home for years. Grandmother did not discover that she was older then Grandfather until her wedding night when, as she said, it was too late to do anything about it! Grandmother had a good sense of humour. She had five children - our respective mothers and John Fawcitt's father. I lived with Gran on and off throughout my childhood, when my parents were abroad, and Gran often told me stories about her past. It was Christmas Day, 1932. I remember it well. It was the only time the whole family ever celebrated Christmas together. I was sixteen and Gran was now seventy-eight. She had suffered a stroke sometime earlier, this had left her frail with slightly slurred speech at times. (In order to get her out she was wheeled about in a bathchair. A three-wheel wicker affair like an outsize chair. A small wheel at the front was attached to a long metal bar with handles. The occupant of the chair steered while the pusher pushed the chair along by a sort of pram handle at the back. A mighty heavy load it was too. I sometimes helped Aunt Alice do the job while Maureen, too young to go to school, sat on Gran's lap.) The family had gathered at Prince Alfred Road for Christmas dinner. My parents had arrived home from China a few days earlier and there was a general feeling of bon-homie in the air. Thirteen sat down to lunch. (The Fawcitts arrived later for tea.) No! The grown-ups argued - they were not superstitious about seating 13. Gran, as was the custom, rose to say Grace. 'For what we are about to receive may the Lord make us truly thankful. Amen.' Strangely, her words were perfectly clear. Always, too, there was the Toast - To Absent Friends. This year it was omitted for the first time - it was not necessary, we were all there! With all her children and grand-children round her Gran enjoyed her day. She was wheeled the short distance home by Aunt Mag accompanied by one of the menfolk. During the night I was awakened by Aunt Alice (I was sleeping at the back of the house) - ~Don't make a noise, go into our bed in case any of the children wake up. Gran has been taken ill and we are all going round there'. Aunt Mag had telephoned the doctor. He gave Gran a dose of morphia to deaden the pain and warned the family she would not last long. Aunt Alice awakened me again the next morning. ~Gran died in the night', she said. I cannot recall that, as a family, we ever all met up again together. Alice Yeo Fawcitt. She married Charles Hedges. 26. Lilian Mary Fawcitt married William Donahue and their daughter Lilian Patricia Donahue, born 1916 married Ronald Gore. Most of the personal notes were written by Lilian Patricia and the family history was researched by Lilian and myself. Line of Descent to Richard Yeo of Pilton.